Anything planned for Friday, November 27? A lot of companies are already planning for “Black Friday”, a day dedicated to good deals, rebates and impressive promotions. For most people, it’s one of the main events of the end of the year. For businesses, it’s one of the most important days of the last quarter of the year. Thousands of people are looking forward to Black Friday, which makes it a key date if you sell your products online. Here are the 4 things you need to check to make this day a success. First things first, do you have a cart on your website? If you don’t, don’t worry! You can set up a ecommerce platform in one click and choose between Magento, PrestaShop, OpenCart or many other options. These ecommerce solutions are a perfect fit for Black Friday as they support promotion and rebate systems and will allow you to be online and ready on time for Friday 27. Given how huge Black Friday is, you need to promote your website. It starts with a special domain name with the .blackfriday extension. Bring your clients and potential buyers directly to the discounts they’re looking for. 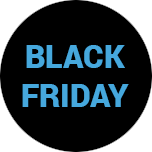 The .blackfriday domain name is also great for branding, as it is easy to remember and straightforward. Let your domain name communicate for you and tell your potential clients that yes indeed, you take part in the Black Friday events! (By the way, we’re working on funio.blackfriday, and we think you’ll like it… just saying). The small lock next to your website’s url is SSL certificate. It shows that the connection to your website is secure. In other words, it shows the visitors that your site is safe and legitimate. Don’t neglect the impact of a SSL certificate for Black Friday! This is a day where traffic is a lot more important than usual. Having a SSL certificate is proving to your visitors that they can trust you as any information they send through your site is encrypted. A SSL certificate will also make your site faster and improve your search engine ranking (or SEO ranking). In other words, a SSL certificate is now a key element of your online success and it would be too bad to miss out on this easy way to improve your online presence! Black Friday means a lot of traffic for ecommerce sites. Do you think your site can handle the high number of visits? It your website is slow because of high traffic, there’s a chance you’ll miss out on sales. If your website crashes because your hosting plan can’t take it, you will also lose a lot of sales and money. Your hosting plan is crucial! A great solution here is a VPS. This virtual dedicated server is powerful and will provide your customers an optimal experience on your site, as far as speed and reliability are concerned. Even better than this, let’s say your success is bigger than expected and customers flock to your website (we hope they do! ), you can upgrade your VPS in a couple seconds and add RAM memory, vCPU or double the disk space. It only takes a few clicks and a second or two, and it could prove to be pretty useful in case you break your traffic record! So, are you ready for Black Friday?